I am going to be knitting this blanket forever. I see that now, as plainly as I understand that I am destined to never catch up on the laundry, and that email can never be truly finished. I also see that a large blanket knit from laceweight might have been a bit of an overshoot, if you catch my meaning. 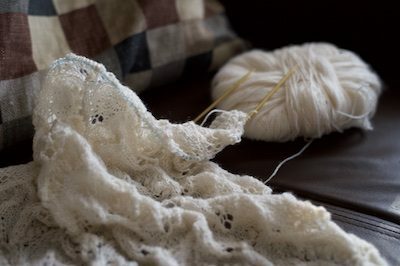 I have only about a month left, and this blanket pretty much refuses to get done, despite much weeping and gnashing of teeth. Today, I have gleefully and delightedly finished the centre. It’s a small centre, as planned, and now I’ve got to make a move to get this thing sorted to be knit in the round. Tonight I’ll leave the stitches at the top live, and then pick up stitches down the first side, then unpick the provisional cast on along the bottom, and pick up more stitches along the second side. 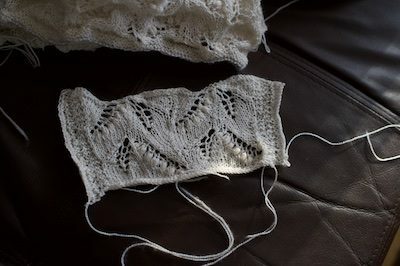 I don’t have time to make a mistake, so I’ve spent a little time today picking up stitches along the side of my swatch. Obviously, one side had too many (you can see it flare out, there on the right) and the other one looks pretty good. That’s the rate I’ll be going with. Forever. And ever. Send wine.